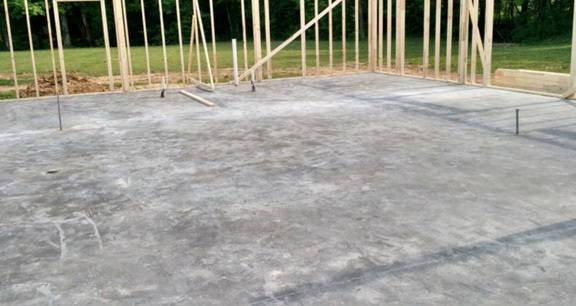 Project obstacles and solutions: David Head Concrete was pouring a 32 yard interior slab on grade for a new house. He had been having issues with shrinkage cracking and was not happy with the concrete from his suppliers. He wanted a mix he could pour at a high slump and have time to work with it while reducing the risk of any shrinkage cracking. He contacted IMI and explained his problem. IMI supplied imix SuperSlab at a 7 inch slump for this project. It is designed specifically for residential interior floors and slabs on grade. It sets up slowly to allow small crews time to place and finish the concrete. A common problem that small crews deal with is keeping concrete plastic long enough to get it finished. Many times water is added to the mix. However, this can lead to weakened concrete, inconsistent slumps and plastic shrinkage cracking. No extra water is needed as imix SuperSlab will remain workable for several hours. The crew for David Head was able to pour and finish this slab in one day. The mix was easy to work with and it produced a creamy paste for a smooth finish. David Head said he was really impressed because he expected some cracks after a few days. However, when he inspected every square inch of the slab, he didn’t find a single crack. For more information on imix SuperSlab, click here.